Beckie ( Reinfelds ) Smith founded the organization as “Corpus Christi Paranormal Group” in 2001. 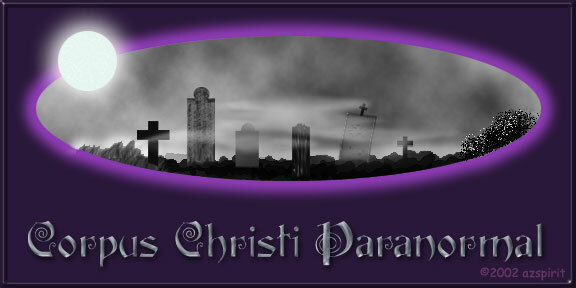 In 2002 , Tammy Peterson joined and merged with Beckie Smith to form “Corpus Christi Paranormal.” From 2001 to Present CCPG has conducted many investigations, as well as, helped in consultations via email and telephone. CCPG is on it's way to becoming a non-profit organization (501 (c)(3)) and will never charge for its services. Donations and the members themselves support us. * We LOVE positive attitudes, Please only bring positivity with you on an investigation , Negative attitudes are counter productive and may hamper our desired objective. * Corpus Christi Paranormal WILL NOT be held responsible or liable for any injuries or damage to any person or equipment at anytime while participating in any CCPG event. No one under 21 will be accepted as members. CCPG CAN NOT and WILL NOT be responsible for minors. * NO member of CCPG will ever charge a fee to conduct an investigation. No member will accept a gift of money or other value for their personal gain for any service performed as a member of CCPG. * There will be times when there will be a limitation on the number people who may attend an investigation, and there will be times when an investigation maybe a spur of the moment opportunity, this is not a intentional act to exclude anyone from these investigations. Sometimes, the property owners set rules and regulations we will have to follow in order to complete the investigation. We will try to rotate all members so they can participate. * WE do not condone individual unofficial investigations . If you go alone, you may get more than you bargained for!! It's not the dead that we should fear, it's the living. It's always best to go in a group, especially when venturing out in the dark. If you were to get injured, who would help you ? * ANYONE who opts to go out on THEIR own and breaks the law in any manner will be held responsible for their own actions, It WILL NOT be affiliated with Corpus Christi Paranormal in any manner , as we DO NOT condone this type of behavior. * NO Trespassing on PRIVATE PROPERTY. Respect any and all " No Trespassing " signs that maybe posted. If you don't have permission, don't enter. * NO Alcohol or Drugs before or during an investigation. * NO Smoking during an investigation. If you smoke you can take a " Smoke" break in a area that won't affect any photographs being taken. * Keep Identification on you at all times. * RESPECT IS A MUST !! When at a cemetery or anywhere for that matter, you must be respectful of the deceased and all property. Any VANDALISM will NOT be tolerated. * Always try to check out a area in the daytime before going there at night, so you can be aware of the surroundings. * Try to remember to always ask the spirits for their permission to take their photos or record them. It should be done out of respect and usually brings desired results. * PLEASE respect your other team members, if there is a problem , Settle it off of the investigation site. * All Team members are EXPECTED to conduct themselves in a professional serious manner, ESPECIALLY around Clients, their Residences or Businesses. Remember , the way 1 person acts reflects on the entire group !! Copyright © 2002,2003-2004 Corpus Christi Paranormal, All rights reserved.